A wool prayer shawl offering your choice black, blue, white or maroon stripe colors combined with your choice of gold or silver lurex metallic yarns. 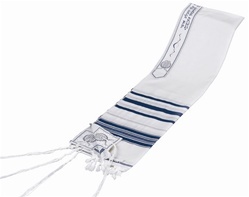 Comes with the brachah (blessing ) on the atara (collar) and Judaic symbols on the corners. Choose your size and color.